Cupcakes 'n Daisies: There's Always A Morning After . . . .
Every now and then, when I post a picture of what I'm working on, someone always comments on my neat sewing table and room. I don't stop and clean up before taking pictures, I just like a neat work area and usually keep it that. That's why I thought you would enjoy these pictures. This is what my sewing room looked like after two full days of appliquéing my Hallowe'en 1904 blocks. Is there a neat way to machine appliqué? 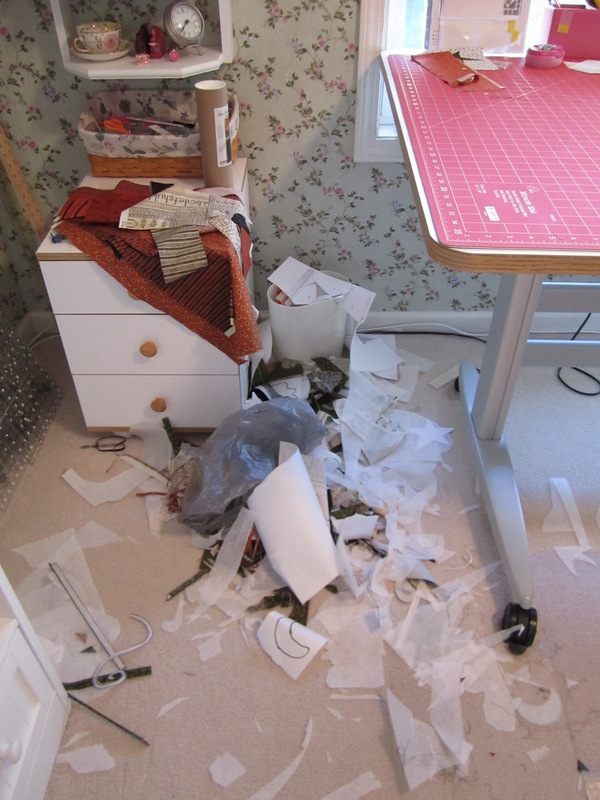 Between cutting bits and pieces of this fabric and that fabric for the blocks and appliqué pieces, using that Steam a Seam paper, and trying to make bias strips, my sewing room looked like it had been hit by a tornado! It took an hour, but I started my day getting everything folded, put up and thrown away. No more applqiue for this project so no more mess. Aaaah, back to my neat and orderly way of life. The rest of my house didn't look as bad as my sewing room, but I did have some general catching up to do there too, and errands to run, so after cleaning my sewing room I only had time to get the hsts on my cat block. But a finished block is a finished block. It's hard to tell from this picture but I went with three different black prints and three different background fabrics. As many of you noticed my blog got a facelift yesterday. My 3 year blogiversary was in August and my 500th post is a little over a week away, good reasons to freshen things up. I'm planning a special post and giveaway to celebrate my new look and 500th post, be looking out for it. Somehow my blog list got lost in the update, I'm working with my designer to get it restored, stay tuned! That kinda looks like my entire house looks most of the time. Thanks for sharing. And congratulations on the anniversary & 500 post milestone. I always look forward to reading your blog! Thanks for sharing your occasional messiness! 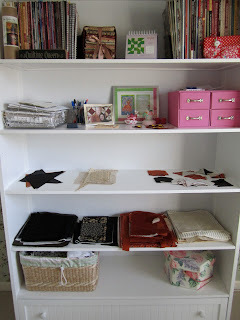 My sewing room is very small and includes my pantry, laundry room, freezer and lots of other projects. It tends to stay a mess! Happy blogiversary! I'll be glad when your blog list is back! Most of my favorites are on it so I just click from your site!!! oh so good to see you have a messy room sometimes too! Your quilt is coming along beautifully ... looking forward to seeing it all together. I love your new blog look ... thought I had clicked on the wrong place today. Very fun and fresh! Love the new blog look ! 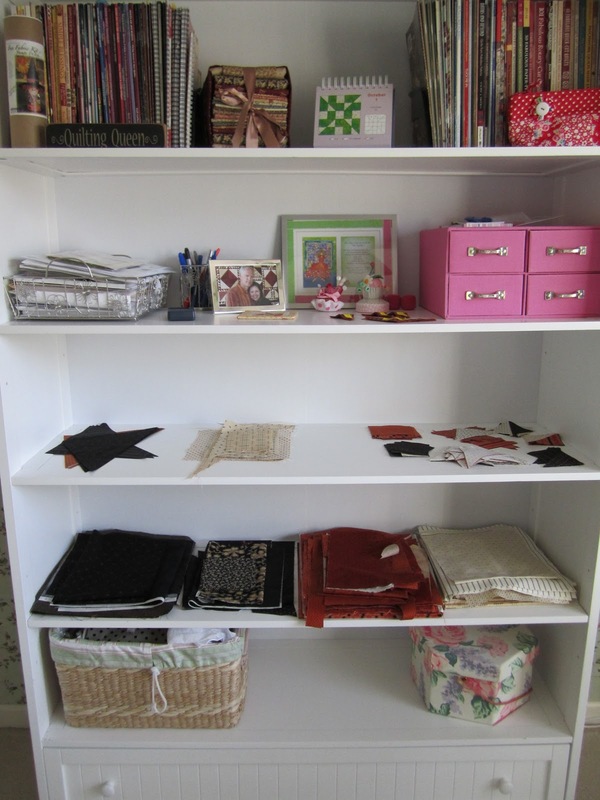 Neat, tidy and orderly is a very good thing. I've been keeping my room the same way since I did the BIG clean up in August - sure keep me happy and productive. Hope the bloglist comes back...I like checking the updates on your blog! 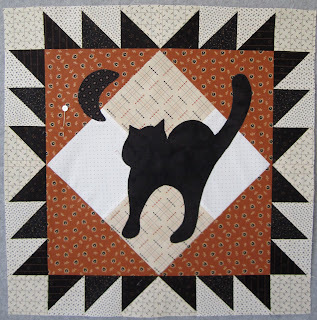 Loving the border around the cat block!! ... And thanks for sharing your 'messy' space - nice to know I'm not the only one unable to keep things neat as I work :) ... Though I admit, when I'm doing fiddly things with lots of *bits* to get rid of, I have a small bucket on the desk (for smaller cut offs) and a bin at my feet for the bigger bits. I still manage to make a right royal mess of my space though, lol! Looking forward to the big reveal - congrats on the past & coming milestones!! I just recently started applique work with freezer paper and such, and I just gave up trying to be neat as I went along and let everything fall to the ground. Just stop to clean it up every so often. Love the PINK cutting mat - what brand and where did you get it? Happy Anniversary! I did quite a bit of paper piecing a few years back. I usually like to keep my sewing space clean and neat, but with paper piecing, as with applique, it's next to impossible! Oh, the freedom to make a mess!!! Happy three years of blogging! When I machine applique I have pieces of fabric everywhere. But I love doing it. I wish I was as organized as you are and so neat! I had a good chuckle when I saw the first picture in today's post! I think it's safe to say that you're not alone! But I agree... it's easier to start a new project if I've cleaned up after completing one. Your new look is really, really nice! It's a pleasure to visit everyday! I checked your blog while I was on vacation in Oregon this week, but couldn't comment - wi fi connection too weak in our hotel room. Your new banner is gorgeous! And congrats on your third blogging anniversary. I really look forward to your posts. LOL I'm happy to see you really are human and not super-woman! 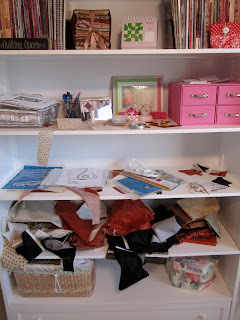 :-) A little mess means a productive sewing day in my book. ;-) Have a great weekend! I love the new look of your blog. I'm trying to get my daughter (my web designer/executor) to update mine, but with her three children underfoot it's hard for her to find time. I very much like your Blogs' new look. I was a little concerned when I saw the blogger list missing as I use it almost everday. Glad to hear it will be still be there once the revamp is complete. It must be very satisifying to be able to scroll through your "resume" of completed quilts. There is an wonderful variety and you can see your confidence & skills as a quilter increasing between the 1st quilt and the latest one. Congradulations on your Blogging Anniversary & I look forward to your 500th post. For some reason even when you show a messy room it still looks neat. Hmmm mine doesn't work like that. Congradulations on your blogging anniversary.. I really enjoy your blog. Hi!!! I love your kitty block!!! They are all very pretty!!! Congratulations on your upcoming anniversary! 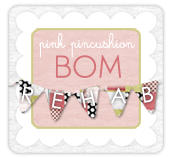 Love your new header and your pink cutting mat--very you! I also miss your blogger list, I use your blog to introduce myself to lots of other wonderful bloggers. Hope it's back soon. You are so funny Thelma lol. But you know that I also appreciate a neat, orderly life, so I totally understand having to get things cleaned back up and "put to right". 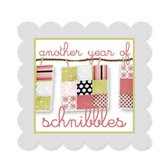 Congrats on your blogging milestones! Hey, don't feel bad, I am that same way. Just do what I have to do and clean up later! I'd never get anything done if I cleaned up after every few minutes. Why clean up so many times, when one time gets the whole job done! BTW..I really enjoy your blog!